Overwhelmed by the complexities of the INL negotiations? Don’t worry. We’ve got you covered. Earlier this week, Attorney General Lawrence Wasden’s office released copies of the written communication between him and Department of Energy officials concerning a proposal to bring in 50 spent fuel rods for research and development at Idaho National Laboratory. Last week, DOE announced INL would not receive the first of those two shipments after the two parties failed to reach a compromise. Here’s the link to the letters on Wasden’s site, as well as our earlier reporting and analysis on where those negotiations broke down. If you don’t have time to read every single letter, Aaron Kunz wrote a synopsis of each document. Check out his timeline at the bottom of this post. After the document release from the Wasden’s office, Idaho Reports reached out to the DOE for comment. In a statement, a DOE spokesperson reiterated the department’s commitment to cleaning up the site, but said obstructing research and development wouldn’t accelerate clean-up. “The Governor understands that turning away important research projects only harms the state further, and he has declared his support for the shipments and the research while continuing to stress the importance of the cleanup program. So have the Lieutenant Governor and every member of the Idaho Congressional Delegation,” the DOE spokesperson said. Below, you’ll find the full DOE response. If you haven’t already, watch our Oct. 16 episode of Idaho Reports, in which we explore in-depth the controversy surrounding the proposed shipments of spent fuel rods. “Recent accounts of the proposed DOE shipments of research quantities of spent nuclear fuel to the Idaho National Laboratory have obscured a few very important points. First, we are talking about small amounts of material – about one hundred pounds of “heavy metal” (principally uranium) per shipment. We don’t view this as “waste” – these materials are required to conduct research that is important to the future of nuclear power in the U.S. and abroad. Going back to the 1995 Settlement Agreement, DOE committed to the State of Idaho to make Idaho’s national laboratory its lead laboratory for nuclear energy research. In keeping with this commitment, DOE has invested nearly half a billion dollars in new INL facilities and equipment over the past ten years. The INL has the people and facilities necessary to carry out the proposed research projects safely and efficiently. So naturally, DOE first proposed to conduct these research projects at the INL. However, given the broad range of nuclear research capabilities across the DOE national laboratory system, and as underscored by our recent and reluctant decision to conduct the first research project elsewhere, DOE has other laboratories that can do much of the work that has been proposed for the INL. The greatest technical challenges facing nuclear energy – and many other clean energy technologies – have to do with materials. 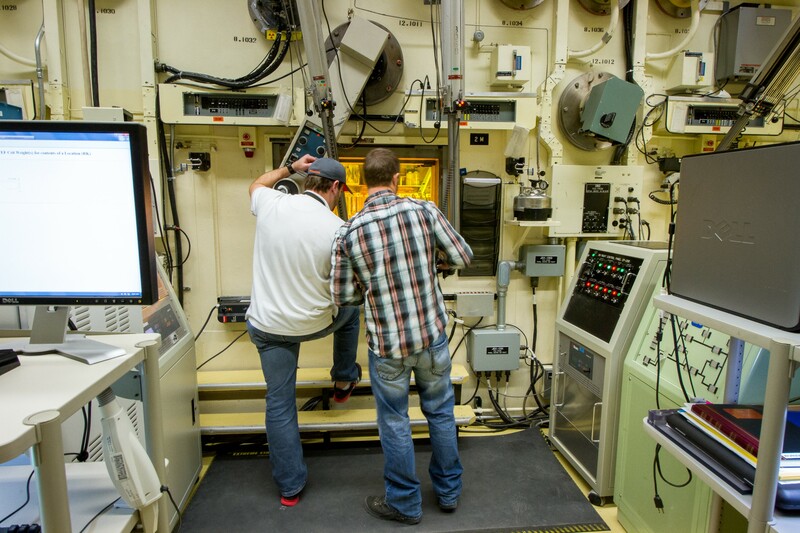 In order to achieve its full potential as DOE’s lead nuclear energy research laboratory, the INL will continually need to build and grow its nuclear materials development and examination expertise. That means the INL will periodically want and need to pursue research projects that require access to small quantities of the most modern spent commercial reactor fuel and other radioactive materials. All sides are committed to completing the cleanup of legacy wastes and agree that curing the missed DOE site cleanup milestones is essential. However, turning away important research projects will do nothing to accelerate the cleanup. From an operational standpoint, there is simply no connection between the research and the missed cleanup milestone. • Outlines DOE’s desire to sent two shipments of research quantity spent nuclear fuel to INL. • Each shipment is one cask of 25 spent fuel rods, totaling 40-50kg of heavy metal spent nuclear fuel. • Funding expected to bring $10-$20 million to Idaho annually for both shipments. January 8, 2015: Letter from Otter to Moniz. • Response to DOE saying Idaho supports proposed two shipments. • 2011 Memorandum of Agreement (MOA) is no longer operative because DOE is not in compliance with the 1995 Settlement Agreement due to missed deadlines starting December 31, 2012. • Reminder to DOE of the conditions of a possible waiver that is required for the DOE to send two shipments of spent nuclear fuel. • Integrated Waste Treatment Unit, which would process liquid waste, (IWTU) must be up and running. • Enforceable agreement signed to resolve non-compliance issues. • Letter sent to DOE after Wasden heard reports that IWTU might not be up and running until spring 2016. • Wasden submits first supplemental agreement proposal. • DOE must commit to return to compliance with the 1995 Settlement Agreement once the Waste Isolation Pilot Plant (WIPP) reopens following closure of WIPP due to a fire in 2014. That means packaging and shipping ground level transuranic waste by December 31, 2018. Retrieval and packaging of buried TRU-waste by December 31, 2019. DOE must place Idaho on a priority schedule once WIPP re-opens. • Proposes that DOE be subject to $60,000-penalty for each day it fails to meet the terms of the supplemental agreement. September 22, 2015: Letter from DOE to Waden. • Letter responding to Wasden’s proposed amendment. • DOE considers Notice of Non-Compliance Consent Order (signed in March) with the IDEQ as meeting obligations of missed deadlines including failure of IWTU to be up and running. • As of December 31, 2014, DOE has failed to comply with its obligation to ship 2,000 cubic meters of TRU-waste to WIPP in New Mexico after is was closed due to a fire on February 14, 2014. • DOE was to have completed calcination of sodium bearing high level waste by December 31, 2012. This process is dependant on the Integrated Waste Treatment Unit, which as of today is still not up and running. • Wasden notes that a state-issued waiver is the only remedy that Idaho has to enforce DOE meeting its timeline as outlined in the 1995 Settlement Agreement. October 8, 2015: Letter from Croley to Wasden. • Response to Wasden’s questions at a meeting held on October 7, 2015. October 13, 2015: Letter from Wasden to Croley. • Wasden sends a second proposal agreement outlining the state’s requirements to issue waiver for two shipments of commercial SNF. New agreement proposal addresses three areas of concern. • DOE must tell Idaho when IWTU will be opeartional or abandon the project and find an alternative technology for treating the liquid waste. • DOE must commit to treating & packaging waste and make sure it’s “road-ready” for shipment to WIPP. • DOE must either ship road ready waste to Texas or prioritize Idaho’s road-ready waste to be shipped to WIPP once it re-opens. • Wasden indicates in his letter that DOE officials said in an October 9th phone call that they would be willing to remove two times the amount proposed to be shipped to Idaho in heavy metal fuel, and that Secretary Moniz would be willing to come to Idaho and at a press conference explain the benefits of the shipments. October 20, 2015: DOE Attorney Steve Croley to Lawrence Wasden. • DOE believes that the “non-compliance consent order” signed with the IDEQ established an already acceptable and enforceable path for treatment of sodium bearing waste. These new deadlines mean the DOE is on the way to getting back into compliance with the 1995 Settlement Agreement. • Croley describes Wasden’s proposal as “additional conditions” and is not realistic in exchange for the DOE sending a “small” amount of spent fuel sent to Idaho for research at the INL. • Wasden disputes Croley’s claim that his proposal constitutes “additional conditions”. He separates DOE’s non-compliance and DOE’s interest of two shipments of SNF as two distinct issues. While similar, not entirely the same. DOE is required to meet the legal requirement to remove nuclear waste from Idaho. But if it wants to bring additional SNF to Idaho it must agree to meet certain requirements. • Wasden “disheartened” that DOE has been unwilling to engage in negotiations. Wasden feels it’s not “unrealistic” to ask DOE to comply with a voter and federal court-approved agreement. “I am asking for nothing more than what the federal government expects of private business,” Wasden wrote.